The Texas Stars take a three game win streak into San Diego on Wednesday night to square off against an equally hot Gulls team. 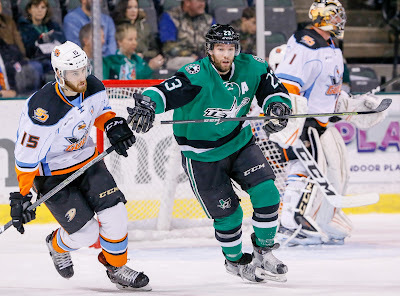 "Galvanizing" and "gutsy" are words that coach Derek Laxdal has used to describe recent wins, and the hope is that the success can be replicated on the road as the Stars kick off a two-week West Coast swing. The Gulls are coming off an OT loss to the Iowa Wild on Monday, but they are playing as well as anyone right now having put together an 8-0-1-1 record in their last ten. Forward Sam Carrick has been flirting with the top ten in league scoring all season long and was recently named the AHL Player of the Week. Former Star Luke Gazdic dons the blue and orange this season and should provide some intrigue as he has brought his brand of physical hockey against the Stars in recent match-ups. Some recent transactions could have an impact for the Stars on the road trip. Forward Robbie Payne and defenseman Nolan Gluchowski were called up from the Idaho Steelheads as depth options. The Stars have been looking for stability at center in the bottom six, and Payne figures to get a chance or two to show his production in the ECHL was no fluke.